XPO What is Xpo yard jockey San Diego starting pay and do you guys recommend working there? Discussion in 'XPO Logistics' started by Clark75, Sep 10, 2018. What is Xpo yard jockey San Diego starting pay and do you guys recommend working there? The yard jockey position listed in otay looks like it is for the Intermodal branch of xpo whereas most everyone on this forum works for the LTL branch. I doubt anybody here could give you a solid idea of the pay structure of other branches of the company. The truck driver position listed in San Diego would start about $22/hr. This is off the street starting pay for any knuckle drager with a CDL at NNA. Nashville. Your suggestion of 22 bucks seems a bit low. dalesr, highspeeds and icuicp like this. 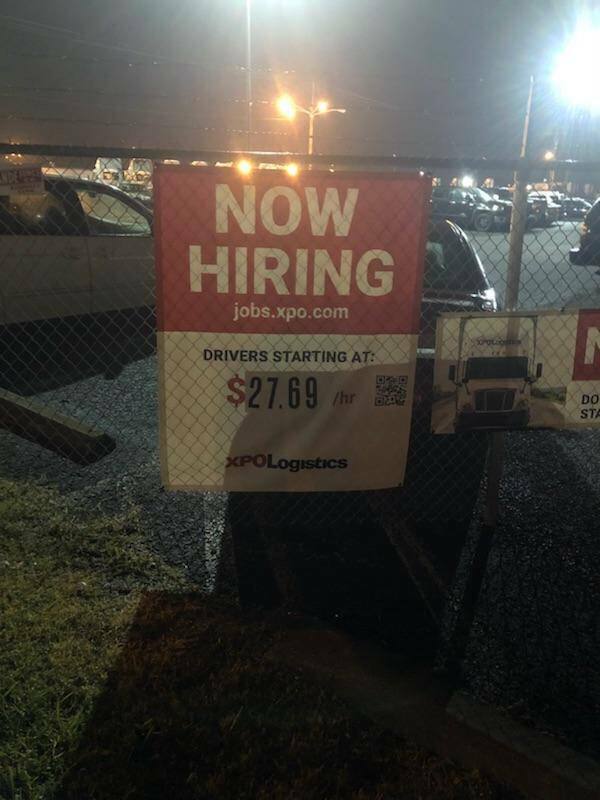 On the website it shows starting pay as $23.00/hr for Nashville driver. I also see there is a $5000 dollar sign on bonus. Is Nashville having a hard time finding drivers? Maybe your terminal is starting drivers on a higher pay tier? What is top scale at your terminal? Is the poster a misprint? They upped our starting pay to $23. Still hard to hire. And there are terminals looking for drivers at top out. Hey, corporate. Maybe if you paid more and offered better benefits people would want to work here. Still gonna be hard to find people even if you do. You have destroyed this company and it’s reputation. WE ARE XPO. WOO HOO ! fellowdreamernomore, icuicp and sportsman800 like this. With no O/T till after 50 HRs ? So I guess we can expect them to raise the top rate there to $32/hr ? guitarman1 and icuicp like this. Now that’s just silly talk! We aren’t UPS! doubledonger and sucker666 like this. Wish I could like this a 1000 times. Wish management would listen to it a BILLION times!!! highspeeds, dalesr and sucker666 like this. I recommend looking elsewhere. XPO is not the best environment to work in. No one in this company gives a . Managers, supervisors, drivers, customer service, everyone is fed up. It don’t take millions of dollars worth of information technology to figure this out. All they got to do is shut up and listen. How did you lose freight ? How did you lose customers ? How did you lose drivers, office staff, mechanics and management ? You earned that result. By your actions. And brag about how happy you are with that result and how much money it has made you. It was a deliberate act. You did it. Why are you researching and analyzing it ? To re-live it and feel proud of yourself ? There are parts of this country where top out isn’t a good enough starting wage for this place. They know this. It’s on purpose. No accident at all. pimpjuice, icuicp and mota like this. I recommend looking elsewhere. XPO is not the best environment to work in. No one in this company gives a : :. Managers, supervisors, drivers, customer service, everyone is fed up. You do not speak for me when you say "no one". I do care about this company. I do care about giving a solid day's work for solid day's pay. I work with good group of guys who do not hate this company and seem to enjoy their job. If you think it is as bad as you believe why are you still here? Good God man there are plenty of great trucking jobs out there begging for drivers of your caliber to come work for them. Go. Serene Gene and doubledonger like this. It’s just hard to believe that everything that has happened is anything other than deliberate. The have been very precise in what they have done. Seems like we should be hearing really soon as far as a sale or purchase. The drivers now have become so lazy that the dockhands complain about how useless and in the way that the drivers are ! I'm starting to forget once vital forklift skills. NEVER on the dock. I'm like a damsel in distress when it comes to any dockwork. Have to call for help. Big Dave, Serene Gene, ROUGHBOY and 1 other person like this. I do not know about your situation but I am getting a hour and a half to two hours a night on the dock or a via. You say take away the dock time... have they done that? If you are getting the dock time then you are doing better than many of the LTL drivers out there. Congrats driver! Seriously where do you drivers work? Maybe you need to transfer. In the low paid South drivers work their butts off. Plenty of time on the dock. Many VIA'S for the senior drivers. Long runs plus dock time equals drivers that don't dream of a union. If you see lazy drivers say something to them. I would. Serene Gene, icuicp and highspeeds like this.